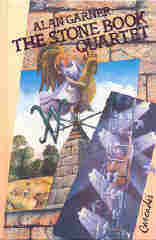 Alan is a local author who was born in the area in 1934 and has lived within about 10 miles of Alderley Edge for all his life. His significance to the Edge is manifold: for starters, he has written a number of books about the Edge - both true fiction and historical fiction. 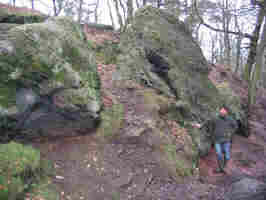 Two of these in particular (The Stone Book and the Weirdstone of Brisingamen) refer to the mines in some detail, as will be described below. 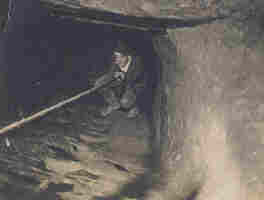 Then, Alan was for many years the custodian (unwittingly) of the oak shovel found in the 1870s, reported by J D Sainter and supposedly lost for ever (you can read more about this HERE). 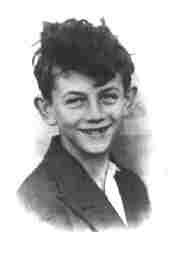 Next, he was an active member of the Alderley Edge Landscape Project, always having something new to add to the knowledge of the area. 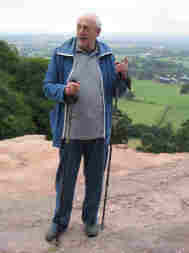 Alan (left) as a 6 year old in1940 and (right) expounding theories to members of the Alderley Edge Landscape Project at the closing walk in July 2005. 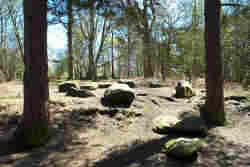 Above is a picture of the stone circle which Alan reckons was built by one of his ancestors. Alan was educated at Manchester Grammar School and Magdalen College, Oxford where he read classics. He is currently fascinated in the history of the area where he lives - both near and far from home - and is always looking for ways to extend his knowledge of the Edge. For a much fuller biography of Alan, refer to the "unofficial website" where there are also details of his life's work, articles and reviews, and links to other related sites. 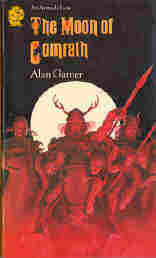 Referring to the unofficial website again (and weeding out foreign and other variant editions), Alan Garner's main publications and their dates are as listed below. As it says in the unofficial website, "... only major published works (novels, collections of short stories, etc) are listed here. There are also numerous uncollected essays and short pieces, plays, and a number of libretti for operas. 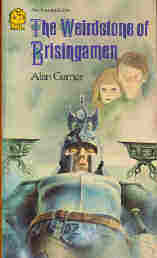 Further details can be found in A Fine Anger: A Critical Introduction to the Work of Alan Garner by Neil Philip." Click on some of the titles and you will be taken to further areas of this page where we will try to illustrate the stories. 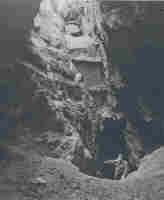 In the Weirdstone of Brisingamen, Alan Garner gives a very detailed account of the journey of Colin and Susan through West Mine before emerging in Engine Vein. 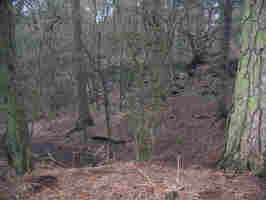 As there are many known locations in the Weirdstone, the pictures have been put on a separate page. However, the two below will give you a taster. 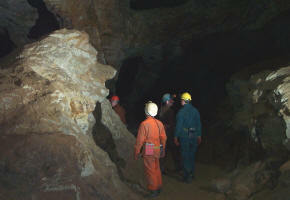 Colin and Susan sat on a ledge around the upper part of this chamber, in darkness in this picture. 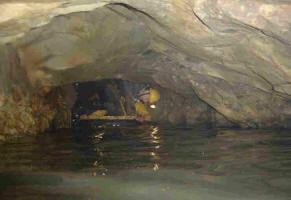 Colin and Susan dropped down Chain Shaft to this water-filled tunnel at the bottom. 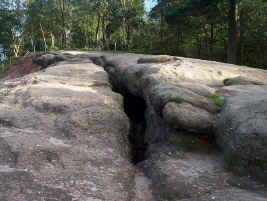 The Stone Book is a quartet of stories but the one with the same title as the quartet concerns the building of Saint Philip's church in Alderley and an exploration of a passage in Engine Vein. St Philip's church is the prominent church at the corner of Wilmslow Road and Ryley's Lane. 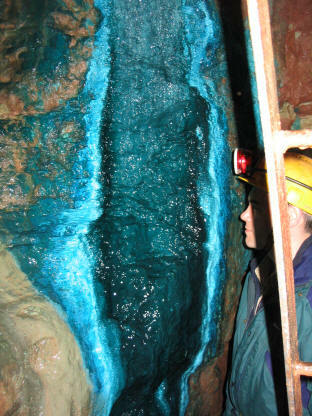 When Mary and her father visited Engine Vein, you could walk in down the way the miners went The sloping Blue Shaft has ancient steps cut in it. When Mary and her father went down, they did not have the benefit of a rope.